In Strange Attractors, Heller Wilson is a grad student studying complexity theory, a branch of mathematics devoted to the study of complex systems. He’s a career-minded guy, and is currently working on a thesis topic suggested by his advisor and designed specifically to get him hired at a high-paying job after graduation. Problem is, he’s struggling with the topic – comparing the resiliency of New York City after 9/11 to the struggles of New Orleans after Katrina – so he decides to track down a former Columbia professor who wrote about similar subject decades ago. Wilson soon discovers that the professor, Spencer Brownfield, is a bit of an eccentric. Among other things, Brownfield explains that he eats exactly 1700 calories a day – no more, no less – and closes their meeting by releasing a rat into a crowded restaurant. However, Wilson is desperate for help with his thesis, so he persists and manages to talk Brownfield into giving him access to his research in exchange for helping with a few “projects”. When Wilson shows up to help with those projects, Brownfield sends him off on a number of apparently random tasks without any explanation. Wilson cooperates gamely for a while, but when he eventually gets fed up and decides to quit, Brownfield surprises him by demonstrating what those seemingly random tasks can achieve when done in concert. It turns out that Brownfield is (he claims) using his theories to “adjust” events in New York City in subtle ways, continually working against the ever-increasing flow of chaos and darkness in the city. Brownfield explains that the reason New York City is so resilient is because he is working to keep it that way. Wilson is drawn back in, and soon becomes obsessed with Brownfield’s theories. Strange Attractors is one of those stories that exists just on the edge of science fiction. Although the idea of using mathematical theories to control events in a city seems fanciful at first blush, upon consideration it feels like the sort of thing that might not be outside the realm of possibility. History caught up with William Gibson, after all. Accordingly, the book is simultaneously both grounded and magical, and the resulting mix is extremely appealing. In some ways the premise reminded me a bit of the basic concepts of Isaac Asimov’s Foundation series, but here the idea of controlling future outcomes is real-time, personal and entirely specific to the city of New York. Brownfield considers himself NYC’s caretaker, and Wilson eventually admits to himself that he also feels a strong enough connection to the city that he wants to protect it. The author and artist clearly share that love of the city, and their devotion is part of what makes this story feel unique. I also loved the art, which is gorgeously drawn and full of color. Whenever Brownfield or Wilson visualize possible outcomes, they are shown as a series of interlocking colored lines bouncing between people or objects. This conceit helps make Brownfield’s theories feel concrete, like something hidden in plain sight if you only know how to look. Also, color is used to signify the current state of the city – red for chaos, blue for stability – and the growing presence of redness helps to build tension throughout as Brownfield and Wilson work to save New York from impending cataclysm. 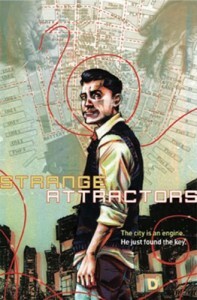 I thoroughly enjoyed reading Strange Attractors, and will definitely be checking out other work by the same author. Recommended.